Throughout ancient history there have been many weapons that have changed forever the world in which the people of the time lived. So, which one would I write about? This required some serious consideration… The 420 feet long Hellenistic Warships were an early contender (7000 crew on board? That’s impressive), then I had to consider the Byzantine Empire’s flamethrower (they had the first hand grenade too in 673 A.D) and of course the Zhuge Nu Semi-Automatic Crossbow had to be an option (10 bolts fired in 15 seconds is nothing to be sniffed at). But none of those weapons had been responsible for an entire nation being conquered. The bizarre weapon I chose was accountable of such a feat. Responsible for defeating a nation that at the time was one of the most powerful and advanced in the world. A nation that we are still fascinated with today; Ancient Egypt. And most impressively the weapon in question wasn’t technically a weapon at all… it was a shield. Invading Egypt was not an easy thing to do. After all its expanses of near endless sand, lack of water and formidable armies had deterred many invaders over approximately two thousand years of history. The Babylonians themselves had tried to take Egypt by force twice and both times had been repulsed, so why did the armies of Persia think that their fate would be any different? The difference came from the cunning of one man and the knowledge of a culture’s religious beliefs. The Persian Leader King Cambyses II was well aware that the Egyptians revered the cat above all other animals as it represented the goddess Bastet. Cambyses had done his research on his enemy, knowing that to defeat them he had to find their weakness. 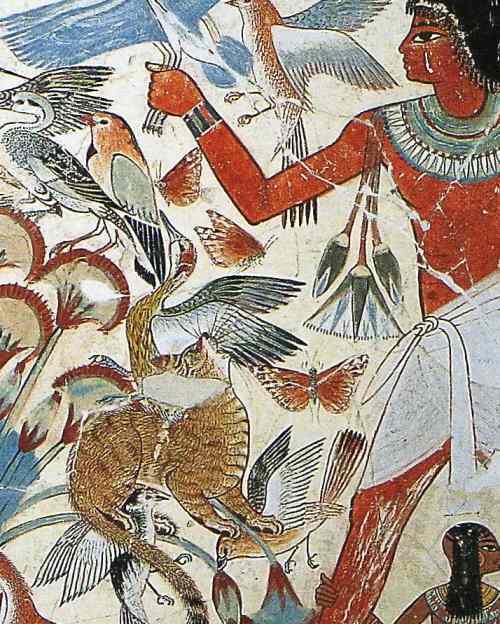 He had discovered that in Egypt the love for cats was so great that the punishment for killing one was death itself. Herodotus the ‘Father of History’ himself commented that an Egyptian, if caught in a burning house, would save a cat before trying to put the fire out or saving himself. And so a plan was formed, I call it… THE CAT SHIELD. So it came to be that at the Battle of Pelusium, Cambyses intended to deploy the cat shield. The Egyptians, under the leadership of Pharaoh Psammenitus, were feeling confident about victory, and why not? They were positioned in a series of fortresses near the mouth of the River Nile, they knew that their position would enable them to pour down a storm of arrows on the Persian Army, perhaps enough to annihilate the force long before they had managed to join the battle. So, it must have come as a horrific surprise when as the Persian soldiers advanced they held aloft battle shields emblazoned with the image of Bastet. The Persian, then revealed the second part of their plan, the soldiers released cats ahead of their formation, forming a protective sea between Persian flesh and Egyptian arrow. It wasn’t only cats that the Persians had leading the charge either, they had, according to Polyaenus, ‘ranged before his front line dogs, sheep, cats, ibeses and whatever other animals the Egyptians held dear’. The Egyptian army, well-fortified as it was in Pelusium near the mouth of the Nile, was at a loss. They could not risk firing arrows at the Persian army less they kill or harm the animals at the lead, they could not charge towards the enemy as they would still risk harming the animals and angering their gods… what could be done? Chaos erupted in the Egyptian ranks that soon descended into a full route, as they fled their positions the Persians pursued and cut them down. Of course this being Ancient History, there are always historical holes to examine and question. Primarily, if this is true, how did the Persians stop the cats from wondering off? After all, it’s not like they would be able to train the creature to march along in front of the army. Different translations of Polyaenus’ writings of the battle lead to different conclusions, some have theorised that the Persian soldiers actually held the creatures aloft in front of them, others, such as the historian Tom Holland, suggest that the Persions had a much more efficient and vicious way of ensuring that cat’s stayed where they should do… by PINNING them to the front of their shields. Regardless of whether the cat shield was simply an image of a cat on a shield or an actual cat nailed to a shield there is one thing that cannot be disputed. Egypt was conquered by the humble shield. The Cat shield had been responsible for the fall of a county. The Cat shield had ended Ancient Egypt’s sovereignty. The Cat shield had forever changed history. Castell Coch: A ‘Wendy House’ Of Epic Proportion!